opportunities to perform in concerts offer lifelong enrichment. 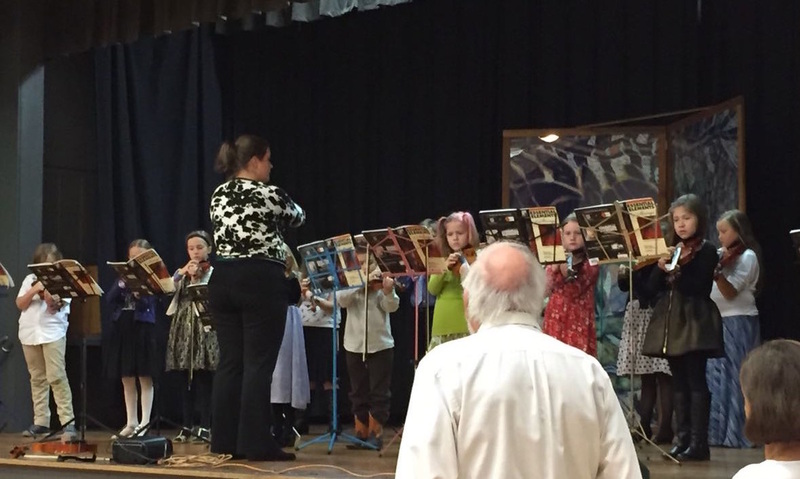 'Music Magic'... As part of its mission, the NCCO provides, in partnership with Nelson County Public Schools, and North Branch School, an after school String Education Program (SEP) in Nelson County. Our dream is for everyone in our community to have the opportunity to make orchestral music part of their lives. Music education is a life-long gift, but it can be expensive. We are committed to providing financial assistance so that all interested youths can participate. Until the Music Magic SEP is firmly established, however, our ability to offer financial aid will be limited by and dependent on the generosity of community residents and assistance from the NCCO grants and other fund raising efforts. The tuition for a 6-week class is $112.50, which includes professional instruction and some materials. Instruments, lesson books and a music stand are also available for rent or purchase through the program. Interested students should complete the application for the course and, if needed, the financial assistance application. NEW IN 2018: Open enrollment starts in January. Now accepting children from 2nd - 5th grade. Middle and High school students are welcome in NCCO's Bridge Program. APPLY NOW: Applications MUST be sent to PO Box 295, Nellysford, VA, 22958. Please DO NOT turn them in to the schools. This year NCCO’s String Education Program will give 2nd to 5th grade area students a chance to study violin and 6th – 8th grade area students a chance to study their choice of violin, viola, cello or bass, using an SOL based curriculum, starting each September. New students may be added throughout the year with instructor permission. ​Tye River and Rockfish Valley Elementary, North Branch School and Nelson Middle School will host the after-school classes and all area students – public, private, home-schooled – are welcome. There will be classes at each school offering weekly, 30 to 60-minute, small-group (1 – 8 students depending on registrations) classes for 6 weeks. In the Summer of 2016 NCCO offered a two hours per day week long violin camp to beginner and advanced students with need based scholarships available. Through fun exercises, and games, students improve their reading and performing skills and knowledge of the instrument. The camp focused on new student recruitment and improving skills for existing students and thereby improve retention rates in the String Education Program. The camp was held at the Nelson Middle School during public school’s summer school program in June. SIGN UP NOW. Camp will be held June 12 - 16 at the Rockfish River Elementary School in Afton. Click here for a registration form and more information. Michael Tyree teaches classes at Rockfish River Elementary School and North Branch. Michael Tyree is a violinist, pianist, composer and conductor from Southwest Virginia. He has a Bachelor of Music in Composition from James Madison University, where he studied violin with the acclaimed Dr. Wanchi Huang and composition with Dr. Eric Guinivan and Dr. Jason Haney. While at JMU, he served as both associate concertmaster and principal second violinist of the JMU Symphony Orchestra as well as principal second of the Monticello Strings. Michael has also studied the violin with Dina Nesterenko, Geronimo Oyenard, and Peter Wilson. He is currently the music director of both the Nelson County Orchestra (since 2017) and the McGaheysville United Methodist Church Chancel Choir (since 2015). In addition to these positions, he keeps an active performance schedule as soloist and with ensembles including the Rockbridge Symphony Orchestra, the Rapidan Orchestra, and numerous chamber groups. In 2014, he appeared as soloist with the Williamsburg Sinfonia. An avid traveler, Michael draws inspiration largely from places he has visited around the world including locations in Europe and the nearby mountains, forests, and waterfalls of Shenandoah National Park. As a composer, he has catalogued works for orchestra, wind band, choir, piano quintet, string quartet, and solo instruments. For the Montpelier quartet, Michael serves as manager, booking contact, and composer in residence. Laura Owens teaches SEP classes at Tye River Elementary School. Ms. Laura Owens, is an experienced teacher of violin, piano, voice, flute and guitar, mandolin, chorus, and drama having taught in public schools, area colleges and her own private studio for over 30 years. She received her Bachelor of Arts in Music Composition from Kirkland College, Clinton, New York, Masters of Arts in Music Composition from Brooklyn College of the City University of New York and Virginia Teacher Certification, K-12 from Lynchburg College. Currently, in addition to teaching in our program, she teaches students privately and is an online instructor of a web-based Music Appreciation class at Patrick Henry Community College, Martinsville, VA.
Brooke Mahanes taught in the Music Magic String Education program from spring 2014 - May 2017. Ms. Mahanes is a freelance performing musician on violin and viola. She currently lives in her hometown of Charlottesville, VA where she teaches group violin classes and orchestra classes to elementary and middle school students. Brooke also teaches private music lessons to people of all ages, and has maintained her private studio in cities all over Virginia and North Carolina since 1999. She is an adjunct faculty member at Longwood University, teaching string methods classes and acting as consultant to the string ensemble. Brooke received her Bachelor of Music in Violin Performance from James Madison University in 2005, then an Artist Diploma in String Quartet Studies from Shenandoah Conservatory in 2009, and completed a Master of Music in Violin Performance at University of North Carolina Greensboro in 2011. She has performed in orchestras and chamber ensembles all over the East Coast and California. She loves many genres of music, and has performed on Baroque period instruments, in classic American musicals, Old Time and Celtic fiddle music, rock, and jazz in addition to her classical concerts. Rick LaRue taught in the Music Magic SEP during fall of 2016 through spring 2017. Mr. LaRue is a violin graduate of the University of Miami School of Music and has performed with fiddle-legend Vassar Clements, jazz-great Ira Sullivan, former Dizzy Gillespie bassist Chris White, and Grammy Award winning country rock band, The Mavericks. He has performed with the Miami Symphony, and recorded with the Florida International University Jazz Band, the Lynchburg Symphony, and the celtic-rock band, The Volunteers. Mr. LaRue has composed, arranged and recorded numerous classical and jazz pieces, and is a Northern Piedmont Regional Fiddle Contest prizewinner. Much of Mr. LaRue's career has been directing and teaching orchestras and string jazz ensemble, guitar, improvisation, fiddling and music theory in public and private schools in Florida, Virginia, New Jersey and New York. Mr LaRue currently performs with the Lynchburg Symphony, The LaRue Jazz Quintet, The LaRue/Donahue Classical Duo, The LaRue/Richarson Jazz Band and Classical Duo, The Front Porch Katz, and the Crosswalk Praise Band and Orchestra at Crozet United Methodist Church. John Paul Gladwell -- taught in the Music Magic SEP during fall of 2016 through spring 2017. An innovative multi-instrumentalist, composer, and musicologist he is also a virtuoso classical performer. As a student at Belmont University, he wowed audiences with William Walton's "Five Bagatelles" for classical guitar, while premiering numerous original compositions as a member of the University's prestigious New Music Ensemble. Upon beginning cello studies with Nashville Orchestra principal JuliaTanner, he discovered he was able to play the instrument immediately, and, prodigiously, began appearing with both the orchestra and a string quartet at Belmont within weeks. In 2000, the Augusta Guitar Quartet premiered Gladwell's adaptation of the Irish fiddle tune, "Geese in the Bog" at the P. Buckley Moss Museum in Virginia, while 2001 saw him touring the east coast of the United States, playing electric guitar with the gospel group, The Crawford Brothers. In early 2002, Gladwell released SOLO, a collection of classical guitar pieces, including a definitive rendering of "Asturius Leyenda" by Isaac Albeniz and a transcendent version of J.S. Bach's "Prelude, Fugue and Allegro." After moving to Los Angeles in 2003, Gladwell quickly caught the attention of Hollywood's top professionals, placing songs in The Matrix: Special Edition DVD Box set and Roadtrip Nation on PBS, and attracting a loyal following of high-profile, private students, grateful for his discretion and virtuosity. As a recording artist, he has played on works by pop songwriter Robbie Seidman (Belinda Carlisle, Hillman & McGuinn), and pop vocalist Maria Vidal (Stevie Nicks, Cher, Celine Dion). In 2011, Gladwell experienced a personal thrill when a chance visit to Ornette Coleman turned into an all-night jam session with the jazz great. Gladwell performed traditional American jazz, along with world music and experimental sound collages with his group The Tertianaires in clubs around Los Angeles, and his 2013 production of Lisa Stafford's rock album, "Not Long For This World" had him working with mixing guru Niko Bolas (NeilYoung, Don Henley, The Mavericks) in the iconic Capitol Records Tower in Hollywood. While performing in a series of author's readings with PEN/Faukner finalist Bruce Wagner and bestselling crime writer James Ellroy, he met fellow guitarist Alejandro Lazo. As a guitar duo, they were invited to represent the state of California in the prestigious " Festival de Mayo", held in Guadalajara, Mexico. Playing to a full house at the historic Teatro Degollodo , the concert premiered 2 original works of Mr. Gladwell and modern works by Lou Harrison and Steve Reich. As an encore, the duo played a modern flamenco co-creation. In 2015 John Paul returned to the east coast where he is teaching cello and guitar, performing and preparing to release a recording in the fall of 2016 with works by Bela Bartok, Barrios , and his own compositions.